Established in 1968, Royal Caribbean International is arguably the world’s most recognisable cruise line, with a vast fleet sailing to exotic destinations around the globe. Currently, the cruise brand has twenty-one vessels in service; second only to Carnival Cruise Lines, which has a total of twenty-four ships in operation. If you’re interested in travelling with Royal Caribbean International, our in-depth guide provides information on the history of the cruise line, its vessels and the availability of Royal Caribbean cruises departing from Australia. Royal Caribbean International was founded in Norway in 1968 by three Norwegian shipping companies: Anders Wilhelmsen & Company, I.M. Skaugen & Company and Gotaas Larsen. The cruise line put its first cruise ship into service in 1968, before adding a further vessel a year later – doubling its overall capacity. After a successful four years at sea, the cruise line launched Song of America, a ship twice the size of the line’s previous vessels. At the time, Song of America was the third largest passenger ship in the world – trumped only by SS Norway and Queen Elizabeth 2 – and this helped the brand achieve global recognition for the first time. Over the subsequent years, Royal Caribbean continued to expand its fleet, introducing its flagship vessel, Sovereign of the Seas, in 1986. The brand went on to purchase private destinations in Haiti and the Bahamas, which they incorporated into Caribbean cruises as private destinations for guests. With a growing passenger capacity, Royal Caribbean International achieved extreme growth and began to take a significant hold on the cruise market. By 1994, the company had built a new, state-of-the-art corporate headquarters in Miami, Florida, where they still run operations to this day. Before the turn of the new millennium, Royal Caribbean had retired all of its older vessels, putting a focus on modern, innovative cruise liners. The brand released a number of Vision-Class ships during this period, including Splendour of the Seas, Grandeur of the Seas and Vision of the Seas. In 1999, the brand launched Voyager of the Seas and with it the Voyager-Class. At the time, Voyager was the largest ship in the world, and Royal Caribbean received prominent media attention as a result. Over the ensuing years, the cruise line launched a number of new vessel classes – including Radiance, Oasis and Quantum – thus becoming the second biggest cruise line in the world. Combining award-winning entertainment with flexible dining and spacious accommodation, Royal Caribbean attracts a vast array of passengers from all walks of life – including families, couples and solo travellers. Guests who choose to travel with Royal Caribbean are often active and fun loving; favouring affordability and entertainment over luxury. Royal Caribbean vessels are relaxed and flexible, providing the ideal holiday for families, as well as adults looking for an adventurous – albeit, refined – holiday. Thanks to a vast fleet of innovative and exciting cruise liners, Royal Caribbean offer cruises to suit a range of itineraries – whether you’re looking for a stimulating family break with the kids or a relaxing, adults only getaway with your partner. Here, we look at the facilities and amenities aboard three of the cruise line’s most popular vessels. Launched in 2015, Anthem of the Seas is thought to be the world’s most technologically advanced cruise ships, boasting a raft of state-of-the-art tech and revolutionary entertainment facilities. The vessel is the second of Royal Caribbean’s Quantum Class vessels, both of which were designed to offer passengers a cruise holiday like no other. With a capacity of 4,180 passengers and a gross tonnage of 168,888, the ship is the second biggest cruise liner in the world, and features an endless array of on-board facilities, including several indoor pools, a “North Star” observation capsule, a multi-purpose SeaPlex facility, interactive robotics and a spectacular events venue called Two70. Oasis of the Seas is the world’s biggest cruse liner, weighing in at 225,282 tonnes and capable of carrying 5,400 passengers. It’s not the vessel’s size that makes it so impressive, however. With a myriad of innovative on board facilities – including seven distinct neighbourhoods, a surf simulator, water park, zip line and adult only solarium – it’s Oasis’ amenities which make it such as unique ship in which to enjoy a cruise holiday. 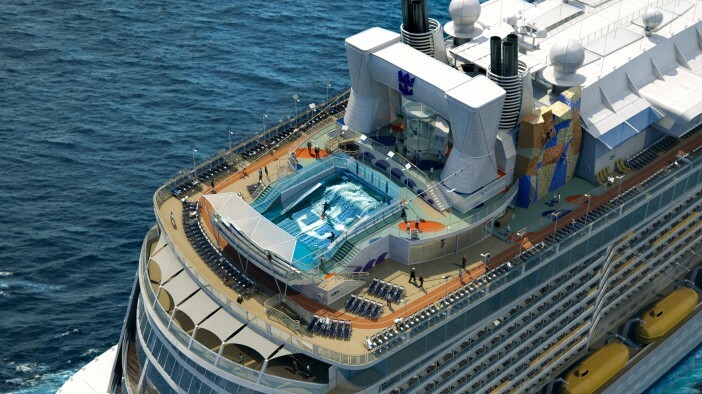 In total, Oasis has 2,706 staterooms, 1,956 of which have a balcony. The vessel also features 46 wheelchair accessible staterooms, which are kitted out with a variety of aids that may make them suitable for those who are less mobile. Combining luxury accommodation with eco-friendly gas turbine engines, Royal Caribbean’s Radiance of the Seas is perfect for the environmentally conscious cruise passenger. Radiance of the Seas is one of four vessels in the Radiance Class range, with a gross tonnage of 90,090 and a capacity of 2,143 passengers. All Radiance Class vessels feature environmentally friendlier engines, which produce significantly less pollution than other vessels in the Royal Caribbean fleet. They’re also built differently from other ships, with a Panamax form that allows them to travel through the Panama Canal. Royal Caribbean currently offers regular seasonal cruises from Brisbane and Sydney aboard four of its vessels: Radiance of the Seas, Voyager of the Seas, Legend of the Seas and Rhapsody of the Seas. With a variety of sailings available aboard each vessel, Australian holidaymakers can enjoy cruises to a wonderful range of destinations direct from Sydney and Brisbane – including the South Pacific Islands, New Zealand and Indonesia. If you’re interested in booking a cruise holiday aboard a Royal Caribbean ship, take a look at our dedicated Royal Caribbean page, where we list current offers and upcoming cruise holidays. Alternatively, if you require further assistance finding a cruise holiday to suit your requirements, contact the Cruise1st Australia team today on 1300 857 345. Images sourced via Royal Caribbean Press Center and Flickr Creative Commons. Credits: Royal Caribbean Press Fransisco Martins, Nicholas D, Brad Granger, Francisco Martins.